We started back in 1998. We started very small. It was a one man band at the time. We started on eBay to be honest. We haven't concentrated on selling Mopar parts to the masses for the past few years, but that recently changed. Since 1998 we've grown into a 27 person company; we like to call ourselves Team Members. We now have offices not only in Ohio, but we have opened offices in four other states. Our company consists of seven different websites; some focus on Mopar, some on Corvette, some on Camaro, some on the new Challenger, some on the new Mustang and even Jeep. We contribute much of our success not only to having such a great team in place, but also because we believe in honesty, integrity and to never be greedy and to treat our customers as we would want to be treated. After waiting to get back into pushing Mopar products, our goal is finding the best quality products and offering them to the hardworking men and women that enjoy these classic Dodge and Plymouth's so much. More importantly, we are working hard to give you the best possible prices. There has long been an absence of quality reproduction Mopar parts at affordable prices. We are working hard to change that. We mean what we say. We are adding product daily and will continue to offer new products; quality products, at amazing prices. Please stay tuned. Our site will be growing every single day, with currently over 7,000 products available; with new products for Cuda, Challenger, Charger Road Runner, GTX, SuperBird, Super Bee, Coronet, Duster, Demon, Dart and even the Lil Red Express! Thank you to all who have supported Josh's Muscle Car Parts over the years and those who will soon become regular customers. Where you see this logo you can be sure you are buying only the top quality restoration parts available. In addition to Authentic Mopar Restoration Products and GM Restoration Parts, we have a huge selection of standard restoration products for your current or next Mopar or GM project. If we wouldn't put it on our Muscle Car, we wouldn't have it on our website. 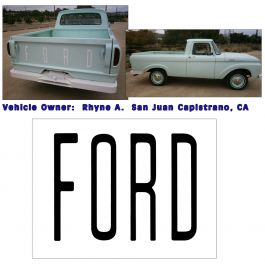 1961-63 Ford Unibody Tailgate Letter Decal Set - Approximate size: "F" = 11" tall x 2.4" long - Decal set fits raised letters on tailgate - Works on Unibody Tailgate - This will NOT fit the 1961-67 Econoline Tailgate.